In this space, I try to cover a variety of writing topics and styles, as much as I can, given the types of writing in my experience. So it is, I'm very excited to introduce a guest blogger to you today who has contributed a piece on an area of which I have no experience: screen writing. 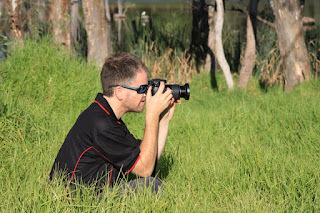 Our blogger today is Stuart Turner, besides being my long-suffering husband, Stuart is also an actor and producer of shorts films and documentaries, and Production Manager for A Cycling Life and Ghost File Investigations. When considering how screen writing is different from writing literature, there’s one significant element that sets it apart – dialogue; it doesn’t matter … or perhaps it's better to say the content doesn’t matter. Of course the structure is critical, but it's important not to get bogged down in the detail – that’s the actor’s job. This is why the screen writer role is pivotal to a film’s success. Screen writers set the scene to enable others to flourish. Granted a great actor and/or director can bring out a wonderful performance, but the film generally succeeds or fails on the strength of the script. I was fortunate a few years back to gain a small role alongside Guy Pearce in Peter Temple's Jack Irish: Black Tide. When I turned up for the dry script read - which is like a practice run - much discussion was around how clever the script was. Note the key word: Clever. Clever helps manage the actors. Clever enriches the overall look and feel of the production. Clever simplifies the production process, thereby reducing costs and giving it a greater chance of survival in a cut-and-thrust environment. Script writers who don’t have a feel for the craft, or have not yet learnt it can create pages and pages … and even more pages of unnecessary dialogue, to describe a character’s traits, problems - whatever - when sometimes all it requires is a well-crafted scene setting. Fade in. Slowly pan across a cluttered lounge room to a slumbering man. As the camera pans we see through a doorway to the kitchen where dirty dishes are piled high in the sink and take-away food containers are on the bench. Sporting scruffy hair and 5 days growth, the sleeping man’s chin is on his chest; his arm flopped to the floor where a glass, on its side is just out of reach, and an open photo album lies in lap, displaying wedding photos of him and a beautiful woman. The side table holds an almost empty bottle of Johnny Walker Blue label atop an open Jobs section of the newspaper; beside it are a well-worn set of Holden car keys and behind, a photo of the married couple smiling and leaning against a Ferrari. Around the room are open magazines and books piled on the table, clothing thrown loosely over armchairs, running shoes and sports clothing dropped on the floor. Despite this the large bookcase behind the couch is perfectly oragnised, with a mix of classic literature and reference material. There are a number of photo frames containing pictures of the wedding couple in places such as Paris, the ski fields and sunning on a yacht. There is no feminine touch to this room. The front door is not locked. A man cautiously opens the door and walks directly into the lounge room. DAVE, TO THE SLEEPING MAN: Oh no mate, not again. From this 15 second scene we can infer the star was once clean, married, well-off and studious (and still is), but now has troubles of some type. These days he is not so financially comfortable and, although he has let himself go, he keeps fit for his own sanity. By adding the word ‘mate’ to Dave’s one line of dialogue we know he is a friend. We also learn that the situation he encounters is familiar and that he is concerned. It does away with pages of explanatory dialogue. Plants knowledge in the viewers' minds without the need to say anything, and, if done well, without the viewer realising it. Combined with film, it does more to build empathy for the character than dialogue alone. It allows the cinematographer (DOP) to work his or her visual magic. Provides instant overview of character while allowing more detail to fall out later. Does not restrict actors to a dialogue set, thus enabling them to bring the characters to life in their own ways . Alright, so where was I? Ah, dialogue. To me, screenplay dialogue is far less about what characters are saying than the authenticity of how it is said. Less is definitely more, and while this holds true for prose in general, I believe it is most relevant to screenwriting; it is, after all, an audio-visual medium. SEAN: Hello Paul, how are you feeling? PAUL: I’m not bad Sean, but I could be better. SEAN: That’s no good Paul. Paul, would you like Victoria Bitter beer. PAUL: Thanks Sean, I need cheering up. SEAN: I’ll order us some drinks then. There was no indication of where they were, their moods or the nature of their friendship. Was the location loud or quiet? Did it smell of smoke or coffee? Was anyone else present? And who mentions their friend's name when they talk to them?! You are looking right at them! They…are…your…friend. This is about as far removed from the manner in which people converse, it’s not funny. And why tell the audience it’s beer? Why not just show them? Needless to say, I thanked the director for the opportunity to audition but suggested the part was not for me. (Read between the lines: I can’t do anything with this rubbish and if the play ever gets a run, the audience will be bored stiff). You have to set the scene for the actors; give them something to work with to bring the characters to life. The acrid stench of cigarette smoke hits Sean as he makes his way past the old boys in groups at tables, through the blue haze. No bands play at the Rock Steady anymore and, though still dimly lit, it’s not so dark that he misses the cheeky wink from the waitress as he greets a man at the bar. The man looks unhappy. SEAN SLAPS PAUL ON THE BACK: G’day mate, how’ve you been? PAUL: Ah, y'know ... could be better. PAUL, THE FIRST REMNANTS OF A SMILE ON HIS FACE: Thanks mate. I need this! As an actor, this gives me enough information to start developing the character before rehearsal and reduce hours. As a DOP I can begin working the camera movements in my mind, and consider what equipment I might need, how many crew members I require; the best ways to bring out the atmosphere of the location. As a director, I am comfortable that there is enough in the script to enable the actors to work without the need of excessive direction or hand-holding. It means I can get on with planning how to get the film in the can. If you are looking for accolades, then maybe screen writing is not for you; do you know who won the Academy Award for Best Original Screenplay for, say, Sunset Boulevard (1950) or Chariots of Fire (1981)? I don’t - well I didn't but I looked them up. Be more descriptive in your scene setting than in your dialogue. Read all dialogue out loud; you'll soon know if the language is authentic or not. Here's a shot of me taking a still photo on location for Victoria's Islands.